Replace your inefficient and hot 25W halogen MR16 dichroic & reflector bulbs with these highly efficient and "warm" MR16 LED Replacement Bulbs. These bulbs feature constant-current drive electronics for steady light output across the full 10-30VDC range. 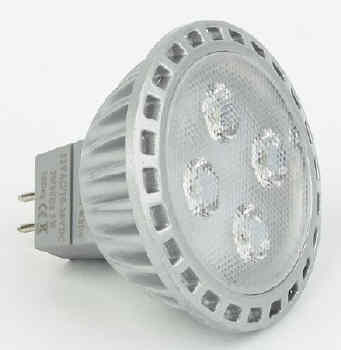 High output LEDs combined with special "4-up" optical lens results in uniform and satisfying illumination. The warm white color temperature matches typical halogen characteristics and is the preference for interior living spaces. Input voltage must be DC (direct current) from a battery source, LED converter, or DC power supply. Not compatible with low voltage AC transformers (i.e. low voltage AC). Beam Angle (FWHM) 30 deg.